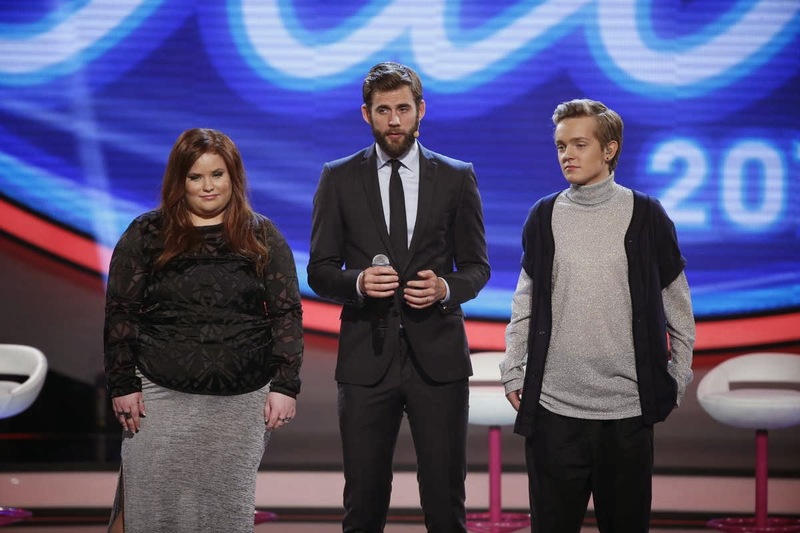 Not one but two themes this week for the four remaining contestants: original songs and jury's choice. The first part is a great idea - songwriting collaborations between the contestants and established Swedish songwriters (although if certain tabloid reports were to be believed, the contestants' involvement in the songs may not have been as extensive as originally suggested). 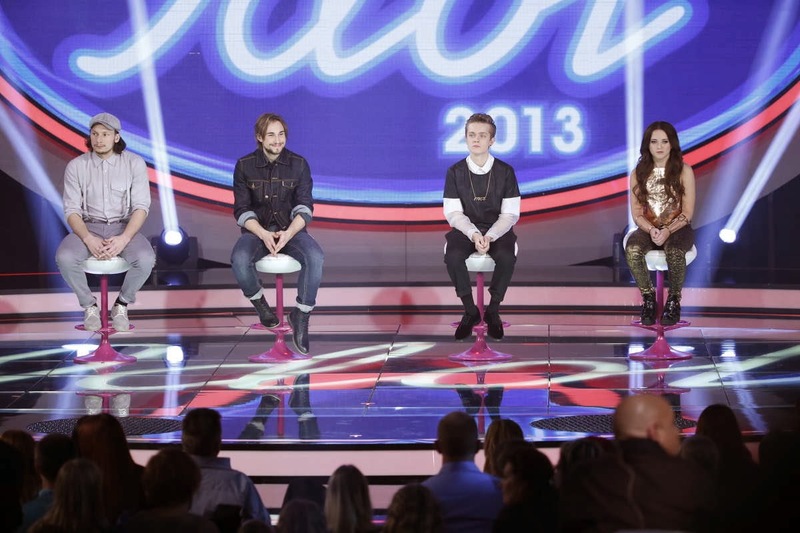 However, it gives a more accurate glimpse into how the contestants may develop as artists, outwith the talent-karaoke format. Tony Nilsson is of course pop royalty in Sweden and in the hands of another artist, say, Darin or Danny, this song would have been an uptempo electro-dance stomper. With Jens, this didn't work for me and his voice grated on the chorus. He is more at home on grittier numbers and this one was clearly a very bad choice and probably sealed his fate. This was my favourite of the night, and a perfect fit for Erik's cool persona. Like a Swedish distant cousin of Hurts. I liked this this soulful electro number the minute I heard it, and I hope it gets a release at some point as it has 'hit' written all over it. A catchy and commercial reggae-flavoured number, however as with many of her other performances, showed up her vocal limitations. A very good match for his voice, which just shows up how wrong the original song choice was. Didn't he sing this earlier on in the competition? Or did someone else? It always turns up in Idol of course, and this week Kevin blandly grinned his way through a Kevinized version of the song. In the infamous words of Simon Cowell, "distinctly average" is the best way to describe the singing footballer. An often-covered classic, which Erik completely brought up to date. This was a vocally impeccable performance which made Alexander Bard cry. Awww! Something very current, but as with Jens earlier, the rough and ready vocals were pretty painful in places. Bottom two time! Jens and Kevin. Jens goes home, and Kevin is saved yet again. Is Sweden having a laugh here? Above: Elin, Erik and Kevin celebrate. I seriously hope that Erik wins the whole thing now. 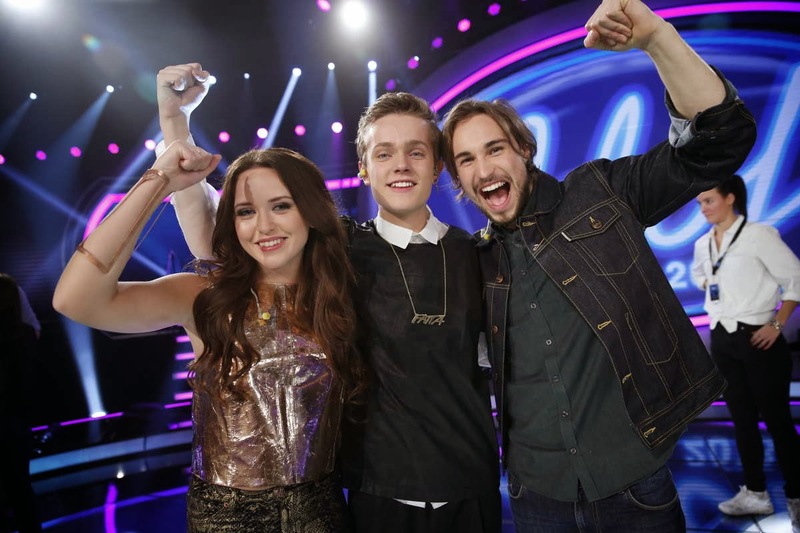 With three contestants remaining, he's about the best prospect as a recording artist that the contest has left. This week's theme was 'unplugged' which, along with 'acoustic' usually has me running for the hills. Crop tops and bad styling - yes it's Elin time again. She continues to have bags of attitude and throws herself into performing the song, but yet again, this was at expense of the vocals. Like Jens, she still has the rough edges and we wouldn't want to polish them too much, but she needs to learn how to harness them and not let her performance get in the way of the singing. That also seemed to be Miriam's downfall earlier in the series. The original Derek and the Dominoes version is one of the best songs of all time, and I have never been a fan of Mr Clapton's decision to rework his own song in unplugged style. That aside, I thought Jens did a great job. He has a world-weary voice beyond his young years and you forget how young he is. Whilst his voice is well suited to the old rock songs, I would be interested to hear how it would sound on some original, modern material. I better not let my mum hear this, as this is her favourite Oasis song and I don't think she'd be too happy. Kevin's USP is delivering a sanitised, easy-listening version of everything he sings, and a granny-friendly covers album is inevitable. But I think we all know by now that he can't raaaaawwwwwk so if they did a rock week (are they doing one this year?) he could be dead and buried on that one, were it not for his army of obsessive fans. A poor song choice for her vocal style. This completely missed the hopelessness and desperation of the original and replaced it with you-go-girl diva attitude and vocals to match. Shame really, as her diva-vocals were back on track and she gave a good performance, but it was just the wrong song for it. I was a massive Seal fan in the early stages of his career but I thought this was one of his weakest songs despite being one of his biggest hits. Unfortunately Erik gave an even more sanitised version, although he sang well. Erik seems to be the anti-Elin - he focuses exclusively on his vocals to the detriment of his performance, and maybe comes across as a little too 'cold'. Current hit by the tiresomely overexposed Ms Cyrus...yawn. Thankfully Elin had more clothes on, however she would be the frontrunner if this series had a Barbara Dex award. 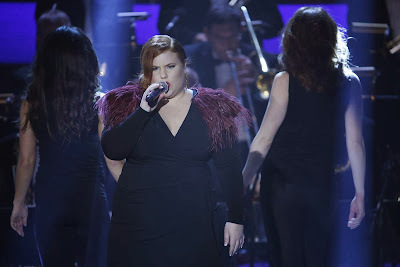 Messy vocals as always, but an incredibly emotional performance which I'm sure would have connected with the viewers. Elin is looking like a definite finalist now. This is one of those songs which has turned up in ads/trailers etc over recent months and turned out to be a shrewd song choice to allow Jens to prove that he wasn't just the guy who is good at the old rock songs. The rough edges are still there, but the consistency is finally beginning to come good. Like Elin, he is becoming a very serious challenger for this year's title, and I think he has the edge. Sanitised - or should that be 'Kevinised' version of the song. He may still be the fans' favourite but IMHO he still doesn't have the greatness or special quality which is required of an Idol winner. If he does win, it will only be for the 'shallow' reasons, and that would be wrong. This is just Sandra being Sandra really, with her punchy diva vocals, which lack the subtlety of Alicia Keys' style. She did it well enough, but she is in a limited vocal niche and lacks the versatility and uniqueness which we would demand of an Idol finalist/winner. Aww, I liked his wee lurex polo neck. I like the idea that he goes for more left-field song choices and tries to put his own little soulful stamp on them. Again, maybe a little too sanitised, yet unlike Kevin, he has the vocal capability for it to work. 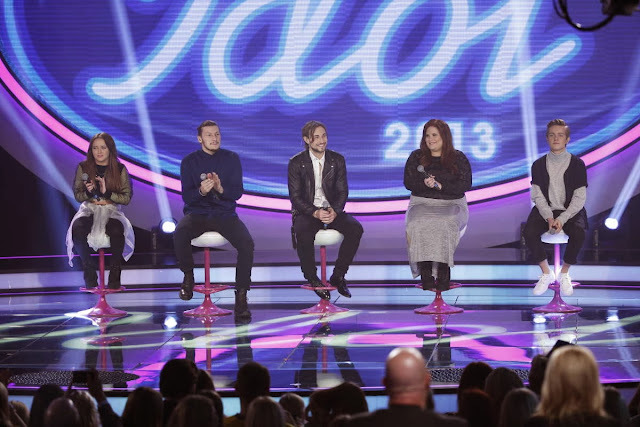 5 contestants remain: who will go this week? Bottom two: Erik and Sandra, with Sandra exiting the competition. This week's theme: Swedish-language hits. And about time too! One of those 'Swedish classics'. Her interpretation was OK but missing something. The judges weren't too keen on it either. There's been a Monica Z revival in Sweden over the past couple of months thanks to the film of the same name, so this was a fairly topical choice of an old song. Erik getting in touch with his jazzy side. Well done! I didn't know this song at all but Jens did it rather well. Now this one's a good old Swedish talent show staple and has been performed on Idol before. Not really too much to say, decent performance. The judges didn't seem so positive though. I don't know the original song so can't really compare it. This version firmly fell into Kevin's easy/comfortable good-but-not-earth-shattering style. I'm still not sure if he would do so well without all the football back-story, and if the Swedish press is to be believed there's a good bit of favouritism going on (allegedly). I'm a little more sympathetic to Elin after reading that she'd been struggling with a viral infection and coughing fits for weeks. (Sounds very close to home). Anyway I'm finally getting used to her vocal style and beginning to think she could have a decent career ahead of her as a recording artist, although she's still a little too unpredictable vocally. This is a very deceptive song as Daniel's verse rhymes can be very difficult to keep up with. I noticed that Erik's version seemed to focus more on the chorus and he injected a bit of soul into the song. I had mentioned in an earlier post that he should try this song as I thought it would be a perfect fit for his voice. Someone at Idol obviously agreed - this was a very wise song choice. Idol 2013's king of inconsistency was definitely on his good side this week. It was OK I guess, although for me it was in far too high a key to appreciate, and never came close to Petra's brilliant original. Sandra was made-over beyond recognition this week, but it's as if they're still searching for a look and a style for her. Much of this had me squirming in disbelief. Lacking the effortless cool of Veronica's version, and all over the place vocally. A punchy performance of the big hit from a couple of years ago. She was mainly on form but lost the vocals a few times and tried to mask this with her trademark rolling grunts. I didn't like her outfit either, but all in all this was better than I expected. Bottom two: Matilda and Elin, with Matilda (above) eliminated. I thought Matilda's time was up. As I said earlier, she seems to be too close to Elin in looks and voice, however Elin has the edge as well as a growing fanbase. A bright, hot, Sunday morning in the city of Palma, and no excuse required to publish a picture of mugs with bulls on them :))) Being in continental Europe though, it's not like at home where Sunday opening is the norm, and most of the stores remain closed, although I'm equally surprised that more are open than we expected. There are not as many souvenir shops in the city as you would expect, but they sell a very comprehensive range of everything from the usual tourist tack to the classiest of souvenirs. And when in Spain, well....more about that at the end of this post. ..but firstly there is the small matter of the 'unique tree' which has a plaque to say so, and which I researched on my return home. It's a 600 year old olive tree which is a symbol of Palma. Here it is. Winding our way into the depths of the Old Town to the Arab Baths - Banys Arabs as it is known here. This is a definite must-see on a trip to Palma, as in an instant it transports you all the way back to the 10th century, when Palma was an Arab city. This is the only building remaining from that era. There's also a delightful shaded courtyard area filled with lots of exotic flowers and foliage. The Arab Baths are small in size but packed with atmosphere and a unique sense of this city's history, and are absolutely worth a visit. Lunchtime! I decide to try out a local version of pizza, known as a coque. This is basically a pizza with the thinnest base imaginable, so lovers of deep pan, look away now. You never expect much from a Sunday in a European city, but today has been a pleasant surprise. Palma remains lively but there's also a nice relaxed vibe. We eat ice cream in the park next to the Almudaina Palace. Life is good. Although it would be even better if this viral infection disappeared. Back at the hotel, I check out some more Spanish telly. They seem to be obsessed with the Spanish royal family. Flicking through the channels I come across "La Voz" which is the Spanish version of the tedious spinny-chairs talent show, "The Voice". 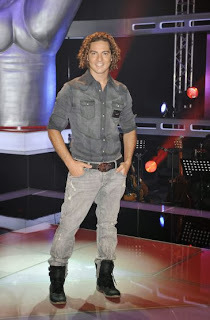 David Bisbal (above) is one of the coaches on it - quite ironic as he came to fame via another talent show, "Operacion Triunfo" which I was obsessed with back in the day. 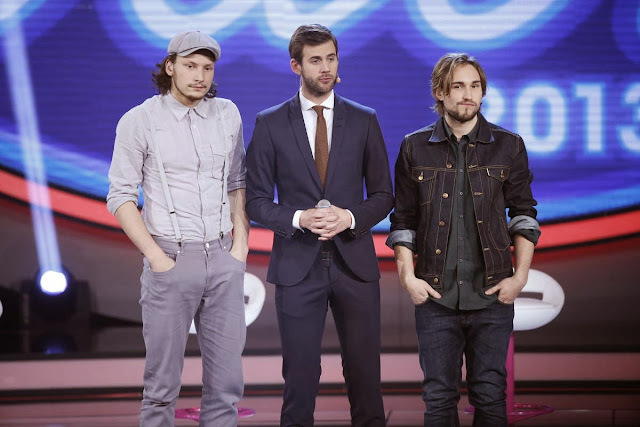 Unfortunately, "La Voz" was just as rubbish as its British counterpart, with all the coaches competing to see who could be the most annoying. As it's our last full day and night in Palma, there's packing to be done, always the saddest part of a holiday. It's another lovely warm night and we have dinner outdoors tonight. Once again it's tapas time!! We've had a very enjoyable time in Palma, a city which exceeded all my expectations. Writing these blog posts, all these weeks later, brings back happy memories of a city which I'd really love to visit again. If you are the type of person for whom a Spanish holiday resort holds no appeal whatsoever, I'd recommend Palma for a more 'real' Spanish experience whilst remaining a tourist-friendly destination. Thankfully it's free of the Magaluf brigade! Although we were about to be brought back down to earth with a bump at Palma airport on Monday morning. For our flight home felt like it had been chartered by the Magaluf weekenders, a different world away from our Palma experience. Thoughts now inevitably turn to our next holiday adventures. All things being well, next spring will bring a new (or old?) destination and another holiday diary to write. But where to? Never mind Christmas, the holiday chat's started already! We're off on our travels today....on an old wooden train from Palma to the little town of Soller, which lies in a mountain valley about an hour away from the city. It's a very cosmopolitan journey, and the train is packed with numerous tourists of all nationalities. There is a small, separate railway station just across the road from Placa Espanya, where the trains leave for Soller, and it's easy to reach particularly if you are staying in the old town. There are also excursions available from the resorts if you are on a package holiday. So, off into the Mallorcan countryside we go, with random goat sightings along the way :)) They promised us orange trees, although maybe it was just the time of year but I didn't see any. There was lots of lovely countryside to see though, but tunnel-phobes wouldn't like this journey as there are a few tunnels to go through before reaching the destination, and one last, very long tunnel. ...and we finally arrive in the little town of Soller, just before lunchtime. Soller is proud to call itself the home of oranges and freshly squeezed orange juice, which is appropriately being freshly squeezed on a stall on the square as we speak. Of course we buy a cup each and it's as refreshing as we'd expect on a baking hot day. We explore the indoor and outdoor market stalls which remind me how much, in the immortal words of Christer Sjogren, "I love Europe" - everything from ridiculously oversized exotic fruit and veg to Aztec-style kids' woolly jumpers. It's soon time for lunch though, so back up to the square for tapas at one of the many restaurants there. It's no time till we need to head back up to the station for the train back to Palma. Due to our limited time in the city, we decided not to expand our day trip to take in the tram journey to Port de Soller, but that option is available should you so wish. Check out http://www.trendesoller.com/en/cms.php for more information. We would recommend the Soller train trip to anyone visiting Palma. It's a very enjoyable excursion which is easily do-able on your own from the city. On our return to Palma we have a refuelling stop for cappuccino and another stroll around before heading back to get ready for our Saturday night out. Things take a bizarre turn this evening, as the hot sunshine makes way for torrential rain. Which means - total shocker - BRING ON THE ANORAK. A very lightweight one, but an anorak nonetheless. Although Palma being Palma, the rain eventually clears to a very warm evening and the anorak is not required after all. It's another enjoyable evening wining and dining in the old city, but it's been a long day and the viral infection which refuses to go away has had a major effect on my stamina, therefore it's an earlier finish to the partying tonight. I've already decided that I want to come back to Palma when I'm feeling at the top of my game! Our second full day in Palma begins like the one before it - with sunshine, blue skies, warm temperatures and that viral infection. After breakfast we head out to explore some more shopping and also do a little research for tomorrow's main activity - more about that in the next instalment. The morning speeds by quickly so it's soon time for lunch - it's tapas time!! It's very clear after just one day in the city that it's a much bigger city than we initially thought. Nevertheless, Palma city centre is walkable, however for the bigger picture I would recommend the City Sightseeing bus tour. The red double decker sightseeing bus is a familiar sight all over Britain and Europe of course, and it runs a regular service around the city of Palma, covering the city centre and outskirts. The seafront/port/promenade seems to run for miles! We were initially thinking of staying further along the western seafront, before deciding to base ourselves in the old town. I think we made the right choice, especially for a short break. However for those who prefer a more 'resort' feel without going out of the city to one of the nearby resorts like Palma Nova or S'Arenal, then the area on the western seafront would be a nice compromise. After our break at the Poble, it was back on the bus for the second part of our sightseeing journey. Due to time restrictions, we didn't have time to explore Bellver Castle, but here's a picture of it, which I took from the sightseeing bus. In the next instalment: we're heading off on an adventure. Choo-choo! Time for “Big Band Friday” – aww, British viewers, did this not take you back to the glory days of “Pop Idol”? – anyway not a Frank Sinatra or even a Michael Buble number in sight; the remaining seven contestants put their glad rags on and reinterpreted a random selection of tunes in ye olde big band style. Sandra – “Wonderwall”. I wonder what Noel Gallagher would have thought of his classic anthem being reinvented ‘Fever’-style? Sandra is now looking comfortable in her role of stompy diva and this was very confidently performed. Gabriel – “As Long As You Love Me”. Never thought we’d see the day when a Bieber song was given the big band treatment, but there you go. I’m not too familiar with this song but Gabriel did his best, however it lacked the ‘kick’ which a big band number needs. Kevin – “It’s My Life”. Not the Dr Alban 90s dance classic, but the Bon Jovi one. Kevin finally went for it this week and injected a bit of much-needed oomph which was previously missing from his easy going style. The only problem was that said oomph was in a different key to the orchestra and on that performance he should have gone home. Kevin wasn't even there on the night, pre-recording his performance so he could play in a football match on Friday night. Matilda – “Umbrella”. It wouldn’t be a talent show without a health scare of course, and Melinda hasn’t been well lately. A decent enough performance of a song I hate, but she doesn’t really have anything to distinguish her as a winner. Jens – “Mama I’m Coming Home”. Oh Jens, Jens, Jens. You frustrate me with your inconsistency. One week he’s good, one week he’s awful. This week though he was on top form, on an Ozzy Osbourne song which I didn’t know, but he managed to effortlessly reinvent it Rat Pack-style. Elin – “Roxanne”. Like Jens, Elin understood how to reinvent a song big-band style, with all the ‘kick’ that requires – something which, as I said earlier, was missing from Gabriel’s performance. However there is still something hugely annoying about her vocal style, those little ‘growls’ really get on my nerves. Erik – “Hurtful”. Erik sings Erik. Vocally spot-on as always, not really much else to say – he’s definitely the most consistent performer in what has so far been a very inconsistent series. This week was a difficult one to call, as all the contestants raised their game, but someone has to go. This week it was Gabriel’s turn to say goodbye. He found himself in the bottom two with Sandra, however Kevin should have been down there. But he’s Kevin, so he wasn’t.